This hydroelectric battery charger uses a Harris cast bronze pelton wheel and a special permanent magnet alternator in a Harris powder coated aluminum housing. This model is available with 1, 2 or 4 nozzles installed at the factory. 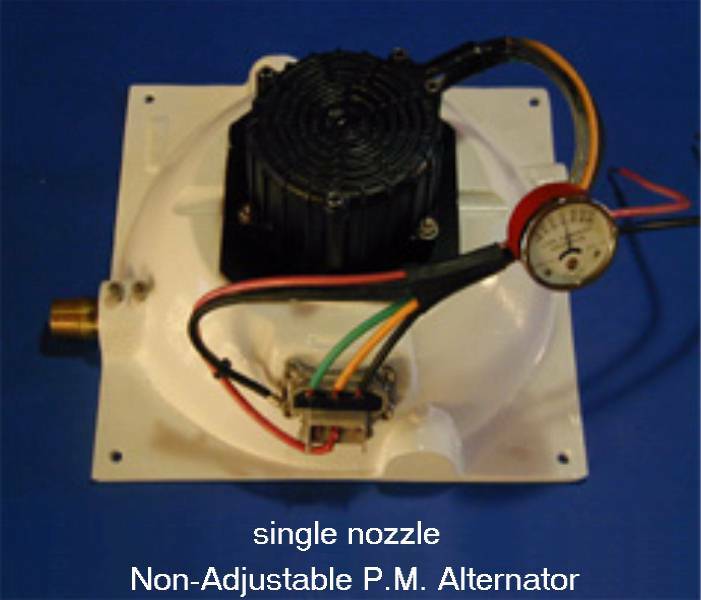 Nozzle(s) can be up to 1/2 inch in diameter. 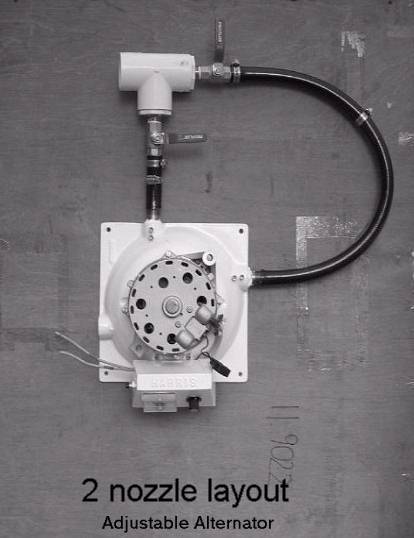 Each hydroelectric system is custom-built to match your site specifications. Hose connections to the nozzles allow for easy disassembly and/or tilting up the unit for inspection and cleaning. Valves must be provided by installer. These units come standard with a permanent magnet brushless alternator with no adjustability. 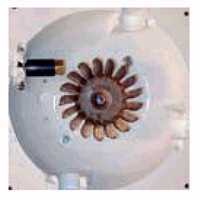 This permanent magnet (P.M.) alternator is more efficient than the old Motorcraft alternator, produces less heat, and therefore lasts longer. Unit can be ordered for common 12Vdc, 24Vdc, 48Vdc and special 96Vdc for transmitting power long distances. This unit will run for years before bearings need to be replaced. Bearings are the commonly available #6203 sealed ball bearings. Two are required and these can be purchased at many auto parts stores. but can be operated to same maximum pressures as standard unit. FEET PSI 1/8" 3/16" 1/4" 5/16" 3/8" 7/16" 1/2"
Please tell us your head, flow, pipe size and length, and battery voltage when ordering using the drop-down menus below. DC cable length and voltage drop must be evaluated carefully when laying out system. Click here for our simple voltage drop calculator. If the turbine will be located far from the battery bank, voltage drop and wire cost can be reduced by using the 120Vdc generator with a step-down controller (such as the FM60 or FM80) at the battery bank. Step-down voltage controller (if ordering the 120Vdc version) FM60 or FM80. Note that this item is billed at time of order since we must pre-pay the manufacturer. This item normally ships in approximately 4 weeks or less.